Bits & Pieces is a brick and mortar store as well as an online retailer with well over 7500 bolts of high quality cotton fabric for you to choose from. They stock an abundance of books, notions and patterns to choose from. They rent and sell our long arm Handi Quilter sewing machines as well as doing machine quilting for our customers. 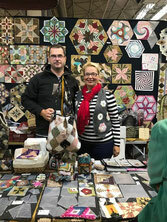 We met Margit and Jozsef many years ago at the European Patchwork Quilt Show in Sainte Marie Aux Mines, France. We quickly became friends. Margit and Jozsef are the creators of the EZPiecer templates for English piecing. Margit will be bringing many of her samples using their templates. 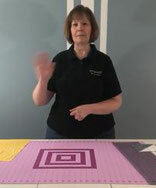 She will be demonstrating how to use the EZ-Piecer templates throughout the weekend as well as their new product the EZ-Log drawing/tracing template. For a preview visit their website: www.foltvilag.com and be sure to watch their videos. Maria Tamaoka started her quilt shop, Pinwheels in 1991. Since then, she has been recognized as the “Taupe Lady” specializing in Daiwabo Taupe fabric. Pinwheels also carries Oakshott fabric, a high quality, hand woven shott cotton. The kits, patterns and projects at Pinwheels incorporate many unique materials and techniques, which Maria finds throughout her travels in Japan and Europe. 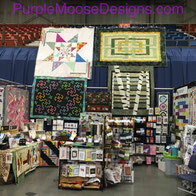 Purple Moose Designs carries quilting patterns for all skill levels, quality batik and landscape fabrics and notions. We are always on the hunt for things that are different, unusual and fun. You never know what you'll find in our booth! The Quilt Basket is a full service quilt shop which proudly features over 4000 bolts of high quality, 100% cotton fabrics, a large selection of books and patterns and notions for every quilting need. We are a Bernina longarm quilting dealer as well as a Handi Quilter longarm quilting dealer. We also sell and service Bernina sewing machines. Among the many achievements that make us unique we are most proud of our own line of patterns. Our creations have already been featured in multiple national quilt magazines and we continue to create dynamic designs that will fit any home decor. Irina V. Mitina marries the traditional needlework of Russia (where she was born) and the love of the vibrant colors of India (where she lived for 4 years) in the kits and finished goods she creates. Cross stitching, knitting, embroidery, appliqué and quilting are all embellished with Irina's color sense and use of decorative stitches, beads and sequins. Since opening her shop, Irina balances family, work and her online store while creating something unique and beautiful. 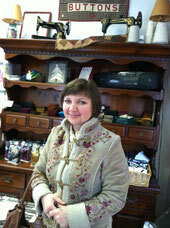 Sue Bennet-Berlingeri is the owner of Sue's Fabric World. 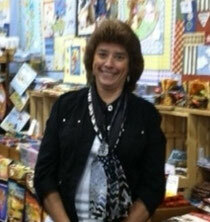 Sue started her business in Mahopac, NY on Feb. 14, 1990. She vends at quilt shows in New York area with her husband Carmine. They have moved the business to Fishkill, NY on July 4th, 2004. Sue carries quilting fabric on the bolt, precut fabric, patterns (some are Sue's original designs) and kits. Her specialty is "CHEATER PANELS." These panels have become the best seller in the booth and appeal to every level of quilters. Come see Sue at her booth and start the creative juices flowing.